Culture: The fuel source that moves the collective organization toward wanting something. “People don’t resist change, they resist being changed.” This famous quote by Peter Senge is a cornerstone principle of any successful organizational and culture change. Human beings embrace change. (Not all human beings equally at the same time). To realize this, compare today’s lifestyle on our planet with 10, 100, 1000 years ago. People are change-seekers. 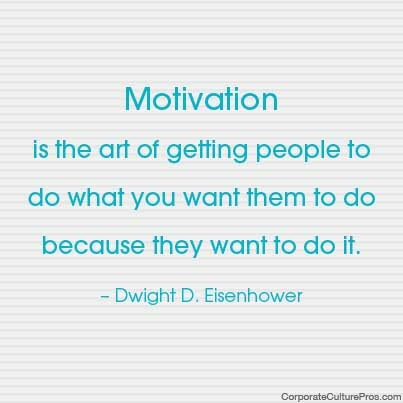 The trick is in how one creates the collective motivation for change in an organization that often has no urgency. The catalyst for change in history came from necessity, such as hunger (we moved our territory or planted crops), or the desire for shelter (we built homes instead of camping in caves). Today’s changes are less about immediate survival (other than survival of quarterly returns and executive bonuses); they are about subtle things like improving productivity and the ability to compete. However, very few employees really care about these things, and they will never be motivated by them in the long term. So, how do we bridge the gap? Trust – people must trust their leaders: First the top leader (CEO); then their immediate supervisor. Without that trust, any call for action falls on deaf ears. Autonomy – Daniel Pink laid it out in his best-selling book “Drive: The Surprising Truth About What Motivates Us” – Everyone wants a voice and an opportunity to make a positive difference in what we do each day. For most employees under the age of 40, this is an assumed right. First, engage people in conversations about what must change and why, to build trust (see #1). Then, tap people’s innate motivation by creating conversations in small groups that allow people to figure out the “how” – empower them to solve the problem themselves.